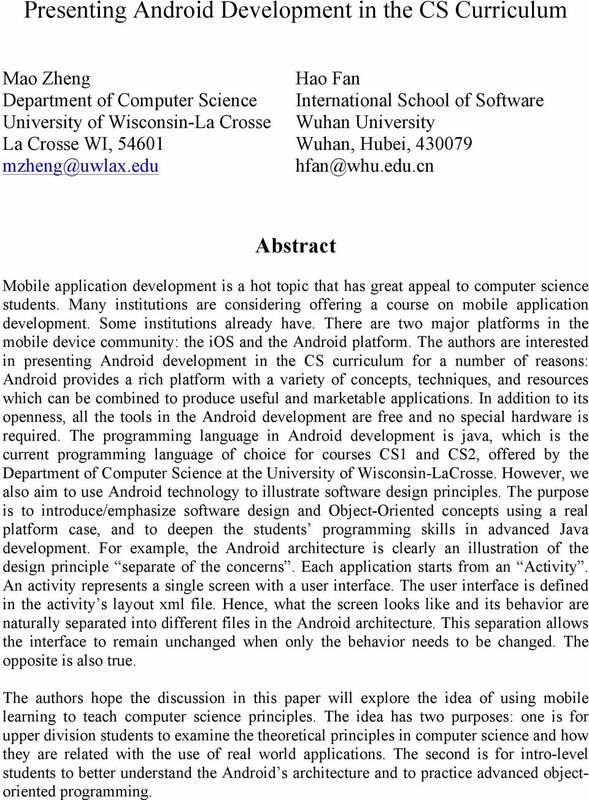 Download "Presenting Android Development in the CS Curriculum"
1 Presenting Android Development in the CS Curriculum Mao Zheng Hao Fan Department of Computer Science International School of Software University of Wisconsin-La Crosse Wuhan University La Crosse WI, Wuhan, Hubei, Abstract Mobile application development is a hot topic that has great appeal to computer science students. Many institutions are considering offering a course on mobile application development. Some institutions already have. There are two major platforms in the mobile device community: the ios and the Android platform. 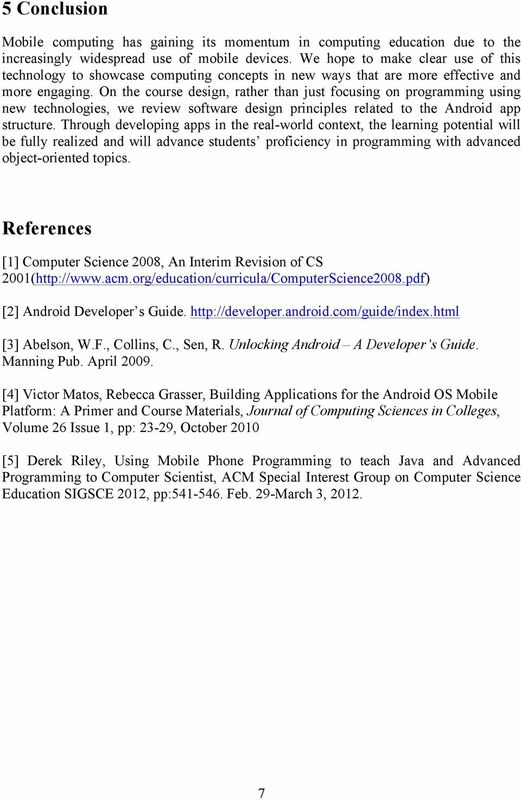 The authors are interested in presenting Android development in the CS curriculum for a number of reasons: Android provides a rich platform with a variety of concepts, techniques, and resources which can be combined to produce useful and marketable applications. In addition to its openness, all the tools in the Android development are free and no special hardware is required. The programming language in Android development is java, which is the current programming language of choice for courses CS1 and CS2, offered by the Department of Computer Science at the University of Wisconsin-LaCrosse. 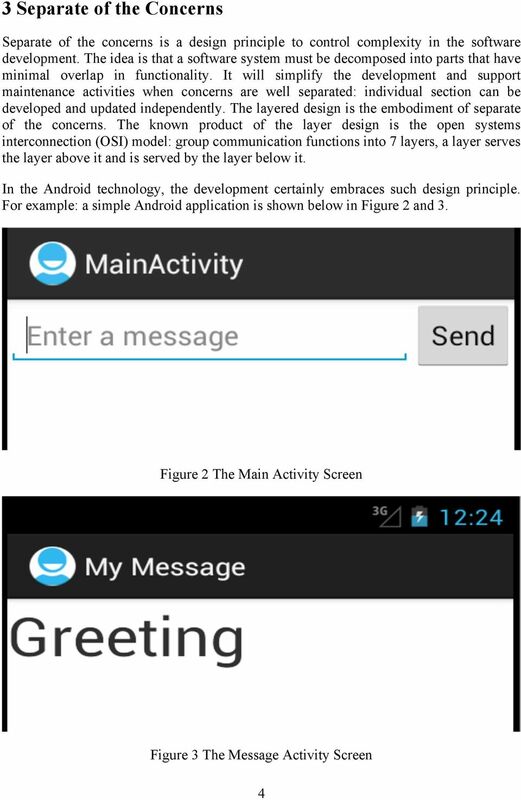 However, we also aim to use Android technology to illustrate software design principles. The purpose is to introduce/emphasize software design and Object-Oriented concepts using a real platform case, and to deepen the students programming skills in advanced Java development. 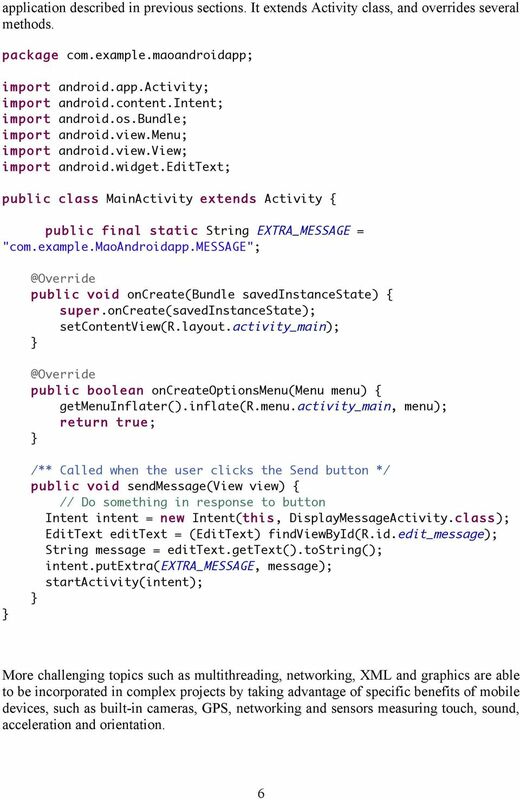 For example, the Android architecture is clearly an illustration of the design principle separate of the concerns. Each application starts from an Activity. 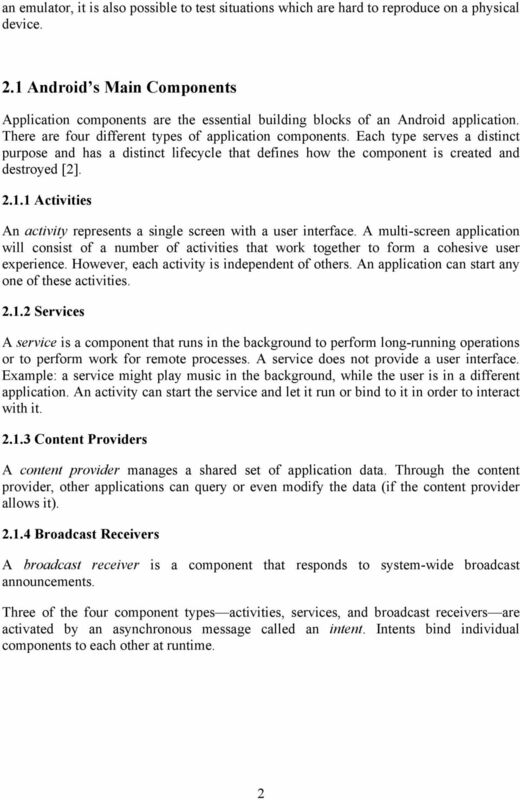 An activity represents a single screen with a user interface. The user interface is defined in the activity s layout xml file. 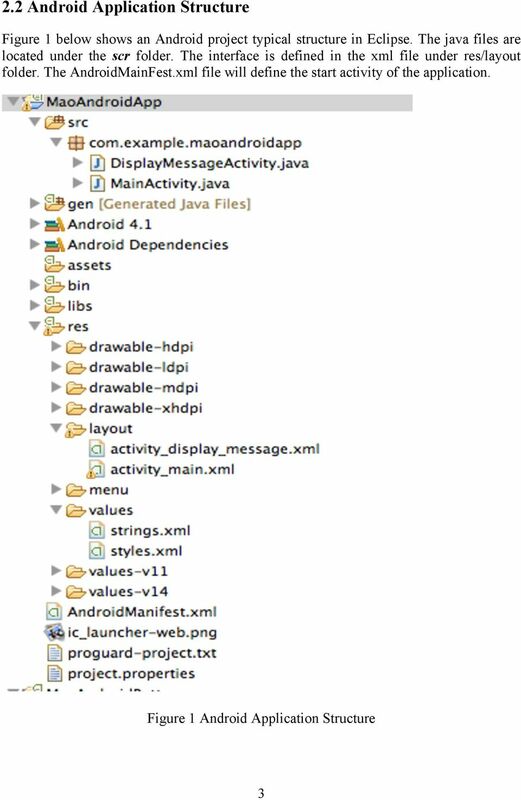 Hence, what the screen looks like and its behavior are naturally separated into different files in the Android architecture. This separation allows the interface to remain unchanged when only the behavior needs to be changed. The opposite is also true. 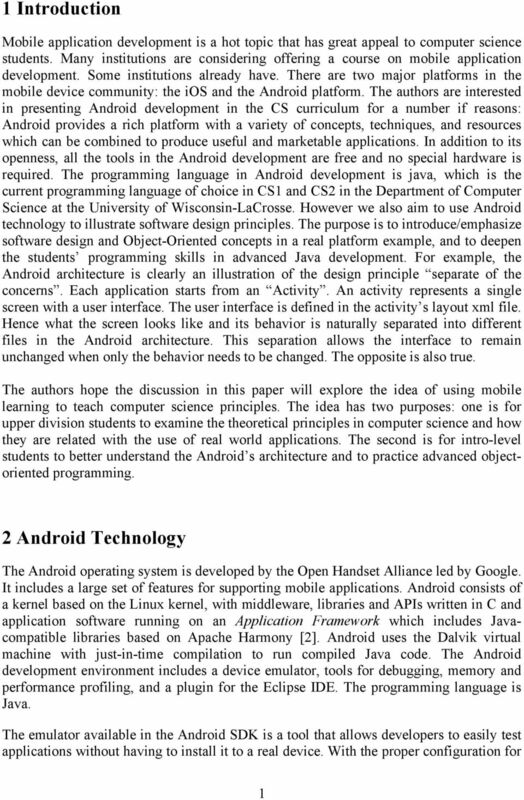 The authors hope the discussion in this paper will explore the idea of using mobile learning to teach computer science principles. The idea has two purposes: one is for upper division students to examine the theoretical principles in computer science and how they are related with the use of real world applications. The second is for intro-level students to better understand the Android s architecture and to practice advanced objectoriented programming. By sending messages into a queue, we can time these messages to exit the cue and call specific functions. 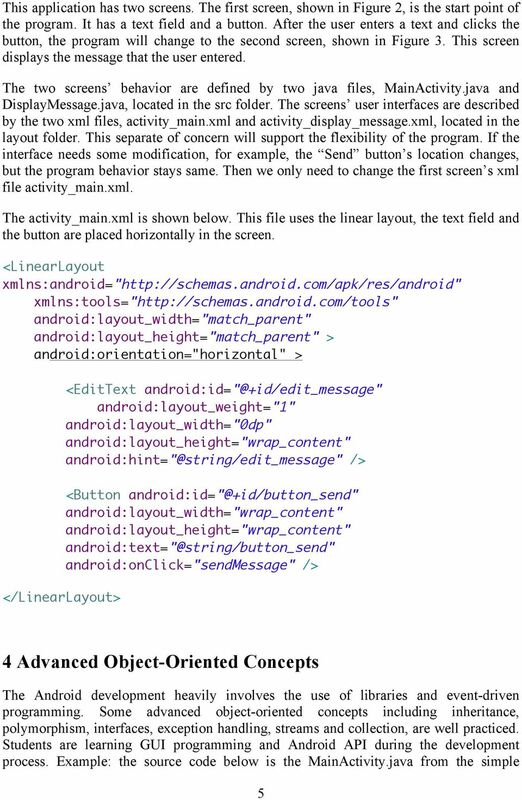 Documentation Version 0.5 ADITION Android Ad SDK Integration Guide for App Developers SDK Version 1 as of 2013 01 04 Copyright 2012 ADITION technologies AG. All rights reserved. 1/7 Table of Contents 1. 2. Click the download button for your operating system (Windows, Mac, or Linux).